Dr. Jones is an Associate Professor for the MFT Department and the Associate Director of Community Partnerships at TCSPP LA campus. Dr Jones is also a bilingual Licensed Marriage and Family Therapist working in her private practice that includes a sliding scale to low income families. At the university, Dr. Jones enjoys teaching practicum seminar, child and adolescents and community mental health among other classes. Dr. Jones has extensive experience in counseling children, adolescents and families, since her internship years in 2001. She started working with kindergarten children in the educational psychology field in 2001 and fell in love with the population. Dr. Jones continued working with children, families and couples in Peru, and then in the U.S. when she moved here in 2005. In the U.S. she did her internship on a free community mental health clinic, and subsequently joined a DMH contracted agency to focus on the Latino community and other minorities. Dr. Jones has worked with 4 different mental health agencies in LA County. Dr Jones was also a lecturer at CSUN and Cal State Dominguez Hills. Dr. Jones has training and experience in a wide range of modalities of theoretical and evidence-based practice modalities including CBT, Solution Focused, Family Systems, Trauma Focused CBT, Triple-P, MAP, Psychodynamics and Cultural Diversity. This helps her in her other job as a clinical supervisor for North Star Counseling Center in Bishop, CA. Her experience in clinical work with a variety of populations allows her to provide real life case examples to students and to enhance their counseling skills for the jobs they will face in their future. 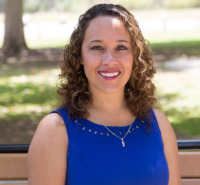 Dr. Jones' research focuses on The Positive Parenting Program and she is also highly interested in child and adolescent disorders, family therapy and cultural issues.